You can sometimes have inlays or onlays instead of fillings to repair damaged teeth. Fillings are soft to begin with and are moulded in the tooth which has been shaped to take and hold the filling. Inlays and onlays are made outside the mouth, usually in a dental laboratory, and then glued to the tooth in the surgery. An inlay sits in a hole in the tooth. 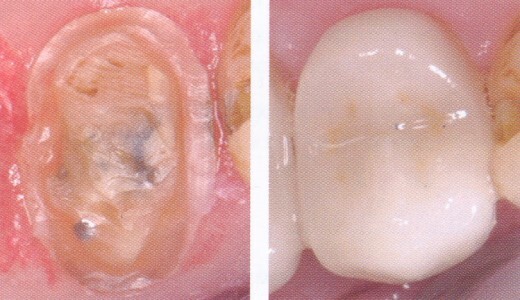 An onlay sits on the tooth and builds up its shape. Inlays and onlays can be made in tooth-coloured porcelain, gold or a white filling material called composite. Different materials are suitable for different parts of the mouth and different parts of the teeth. glue the inlay or onlay in place on your next visit - the dentist may make small adjustments, so that the tooth is comfortable to bite on. Inlays and onlays are strong and can last longer than fillings. They are especially suitable for the chewing surfaces of back teeth and for large repairs to front teeth, where it can be difficult to make a white filling look natural. Your dentist can match the colour to your other teeth.